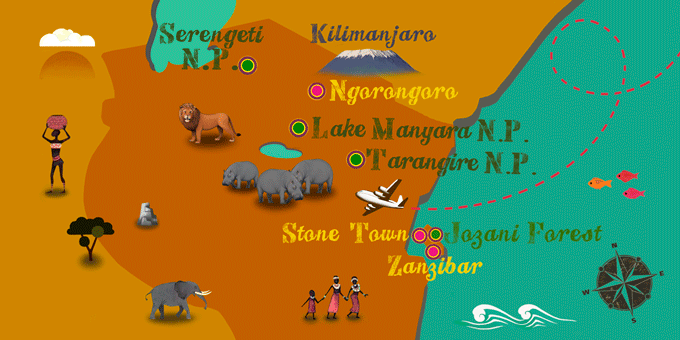 Travel to Tanzania and penetrate one of the most fascinating countries in Africa, covered in national parks, lakes, and mountains - like Mount Kilimanjaro. A safari in the Serengeti or Tarangire will allow you to meet the Big Five, the five kings of the Savannah: the lion, the elephant, the leopard, the buffalo, and the rhinoceros. Lake Manyara, as well as being home to these animals, is a paradise of birds. You can find up to 300 species here, from flamingos to eagles. Giraffes, hippopotamuses, and gnus can often be seen in the lake. Travel to Tanzania and experience one of the great wonders of nature: the Great Migration, the displacement of thousands of herbivorous animals from the Serengeti National Park and the vicinity of Ngorongoro towards Maasai Mara, Kenya. This animal journey takes place in April and May, the time when the parks of Tanzania begin to suffer drought from the heat and the species that live there flee in search of water to ensure their survival. A fascinating spectacle which can only be witnessed in these two African countries. Although a travel to Tanzania implies Safari tourism, the island of Zanzibar is the perfect haven of peace to enjoy a sunny beach holiday. The island is blessed with fine white sand, bathed by crystal clear waters - the Pacific has got nothing on this. Further inland, a tour of the Jozani forest will introduce the Red Colobus, a unique species of monkey. Also, the ancient capital city of Zanzibar, Stone Town, has been declared a UNESCO World Heritage site. You can visit sumptuous palaces and Arabic mansions, as well as see the house where Freddie Mercury, the singer from Queen, was born. A visa is required. Issued on arrival in the country. Price approximately $65. Maximum 3 months stay. 230 V. Adapter not required. 3 pin UK standard plugs used. Vaccination against Yellow Fever is recommended. Carry your international immunization card. Tanzanians drive on the left-hand side of the road.